Believing we had to help this little blue eyed, floppy eared puppy, we began making calls and appointments for friends to take a look and see if they could adopt him. He looked quite desperate and by no means dangerous, so in the mean time we did everything we could to make him feel at home, including cuddling him when he cried and helping him find his food. The puppy, which I refused to name, was dropped off on a Sunday night and by Wednesday, with no luck in finding another home, this little guy had snuggled his way into our hearts. So the nameless pit bull became Junior. That name seemed quite appropriate back then when he fit easily in one arm, but now, ironically, there is nothing “junior” about him, as he weighs in at 90 pounds. We raised Junior as one of the family. We put him through puppy training classes, hired a dog trainer who specializes in bully breeds and have taken him everywhere we can. 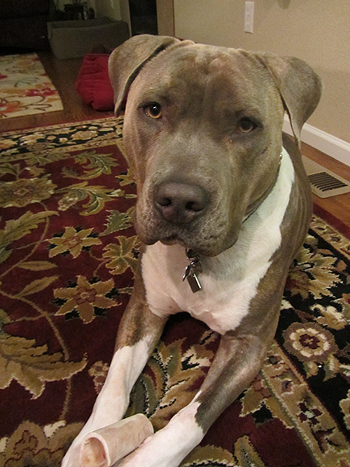 Junior gets along great with other dogs, loves people and enjoys giving anyone a sloppy kiss. My family and friends say that it is because of their relationship with Junior that they are no longer afraid of pit bulls. The stereotype that surrounds this type of dog was certainly alive and well in my thinking and that of our family. 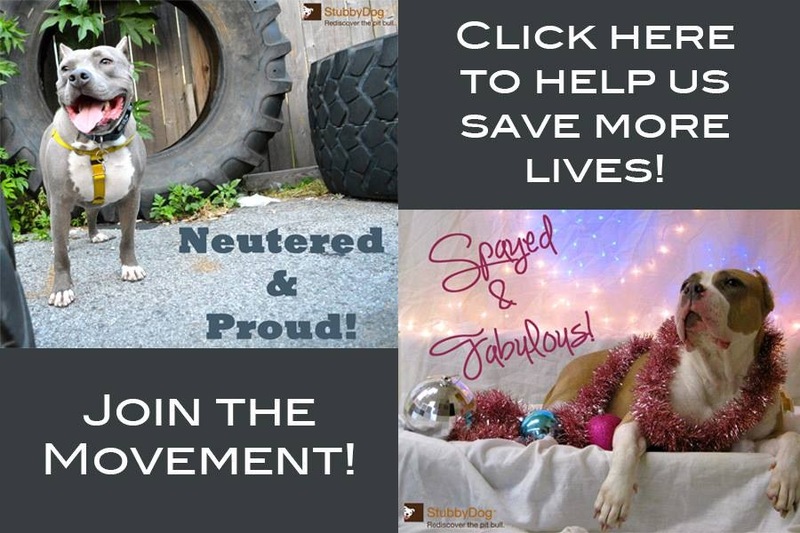 It now gives us great pride to know we have somehow made a difference for one dog, and in our own way, for the reputation of pit bull type dogs in general. We did not take Junior home from a shelter, but we did rescue him from the next step, which would have been the local animal rescue. His adoption has been a blessing, and we can only imagine what might have happened had we not intervened. He is a joy and a delight, and I am very proud of my stubby dog! Now instead of saying, “We can’t own a pit bull,” I proudly profess that we have and adore all 90 pounds of this funny, loving, never a dull moment, canine companion. Junior is very handsome! Glad you and your family had an open mind and opened your heart & home! I laughed at your ending funny loving and never a dull moment. That describes our pitt too. My partner and I were just sayng this morning that she’ll soon be 6. We wonder if she’ll ever settle down and not be so puppyish. But…..we love her just the way she is. Oh my, he’s GORGEOUS! And 90lbs!?! WOWza! I didn’t have negative feelings toward the breed before we adopted our first pitbull-type dog — I’d never met one personally but loved their look and felt there must be more to them than the hype. They totally change your world when you let them in – we full-on advocate now! Thanks for all the great comments! Junior is so special to me and I can’t thank the Lord enough for brining him into our home. 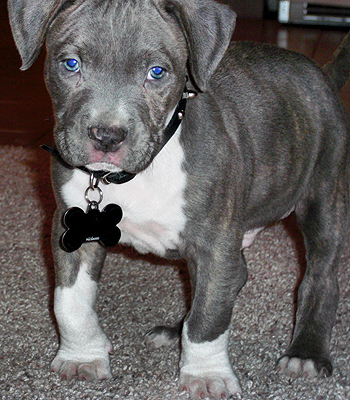 I absolutely love him, animals and of course Pitbulls! You don’t know how wonderful they are until you get one. My dad sent me this article. I asked to you know Ashley? We do know you! I didn’t recognize you and didn’t put Junior and you together. He is a super handsome boy! Good job raising a wonderful dog! Great article! I love that we get to do our part to help these guys. Callie just passed her canine good citizen and therapy dog certification yesterday! We are ready to start volunteering! @ShawnLowe That’s wonderful, if you would like to share your story about Callie with us, just email [email protected] and tell us all about her and send photos. We are celebrating therapy dogs into April, but we would run your story anytime too! Thank you, and way to go Callie! @StubbyDog I will do that. Thank you for the invitation!